I know that cupcakes and pastries have become quite a fad in Saudi Arabia for almost 3 years now. Several housewives have started learning the art of baking but I’d say, only few are natural in the craft… one of them is Nadia of Bake Fresh. It was around a year and a half ago when I knew of Bake Fresh, I started contacting Nadia about cream puffs. Then I discovered how skilled she is in making elaborate cakes and pastries… Nadia is quite an artist! Well I won’t be a hypocrite and say that I don’t buy from others (commercial or homemade), yes, I do, and I do believe that each baker has their strengths that stand out from one another, one could be good in cakes, one could be good in pops, tarts, icings —oh the diversity! But since I am talking about Bake Fresh, I’d say elaborate cake/fondant designing is Nadia’s forte! I would highly recommend Bake Fresh for your cake needs (click this link for her facebook page). Not only that she sells cakes and pastries, she could also teach you how to make these gorgeous creations! Since I am getting addicted to deals, I feel I had to share our new purchase from COBONE.COM for my Manic Monday entry. I love love love our newly bought Cobone deal! 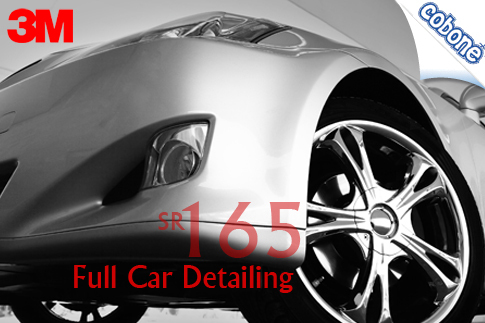 It’s the 3M full-car detailing! 3M targets 300 buyers and lucky enough, we were able to buy one voucher for our car and we were able to entice our friend to register and purchase his own since this deal is a cobone-per-person-deal only. Is this awesome or not!?! Upon browsing my cobone account just now, I saw that the 3M deal is over and was able to meet their target of 300 deals! We’re just so glad to have acted fast enough. Goodness gracious! I was even thinking of delaying the order since it’s still valid until 27 February 2012. Good thing I didn’t follow my lazy bones. One advice, if the deal you initially liked is on, “act fast” and don’t hesitate especially if it’s too awesome like this. Otherwise, you’ll end up regretting it.